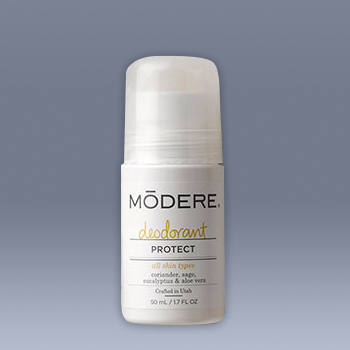 Natural deodorising benefits of coriander, sage, eucalyptus and aloe vera to help keep you smelling and feeling fresh. Methylpropanediol, aloe barbadensis leaf juice, butylene glycol, hamamelis virginiana (witch hazel) extract, water, coriandrum sativum (coriander) seed extract, alcohol, salvia officinalis (sage) leaf extract, commiphora myrrha resin extract, eucalyptus globulus leaf extract, saccharomyces ferment, fragrance (parfum). Apply to underarm area. Do not use on broken or irritated skin. "Sure, others claim to be safe, but have they been doing it for 25 years? We have. We pioneered safe, non-toxic products and demanded excellence from ourselves every day along the way. And still do. We don't compromise—you'll never see us use cheap ingredients, harsh chemicals, test on animals, or create lame products. This is our promise."